At this point in time, the only commercial platform that runs DDR4 is the Haswell-E processor combined with the X99 chipset. For that platform, the processor has a quad-channel memory controller and in order to extract the best performance, four memory modules are needed – we published a large breakdown on the effect of the DDR4 memory speed on this platform earlier in the year. 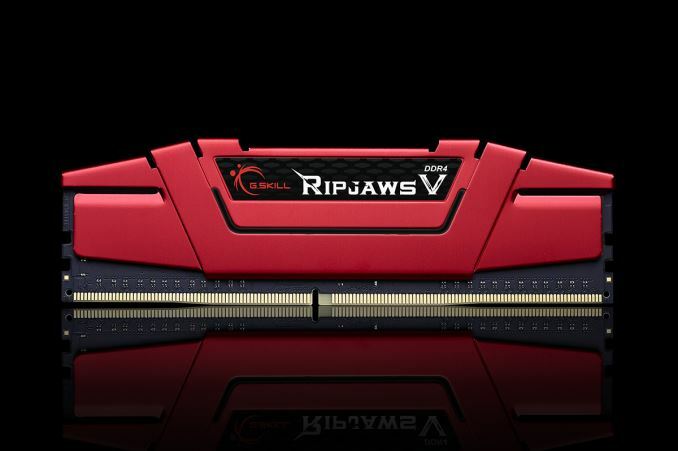 Despite this, G.Skill is today announcing its upcoming memory kits – specifically ‘designed for 6th Gen Intel Core Processors and Z170 motherboards’, or what the rest of us calls ‘Skylake’. 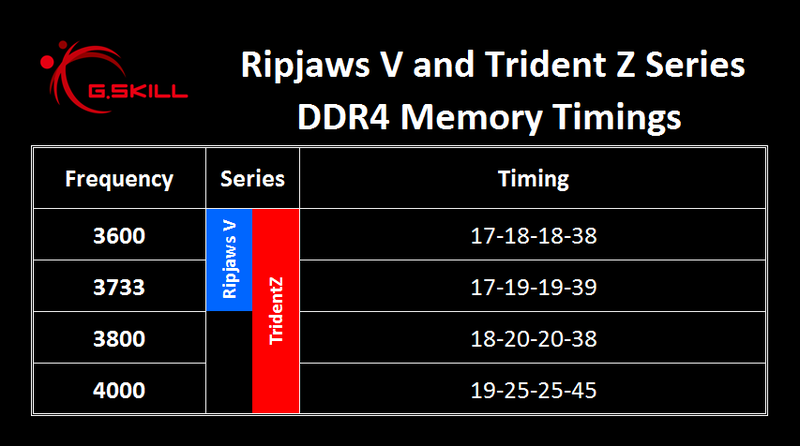 These new kits fall into two series called ‘Trident Z’ and ‘Ripjaws V’, with the Trident line being typically faster than Ripjaws although there will be crossover. Memory companies usually do this in order to enable users who prefer one style over the other but still want a certain speed. These new kits, not only being announced seemingly early, also seem to break DRAM speed barriers for kits in the market. The new Skylake platform is expected to have a memory rating equivalent for the JEDEC specifications for DDR4, which is DDR4-2133 at subtimings of 15-15-15. One of the new kits pushes through to DDR4-4000, almost doubling the frequency of the JEDEC standard, although with a slightly slower sub-timings of 19-25-25. These will be available only in 2x4 GB form, with pricing not announced. All Trident Z modules will run at the higher DDR4 voltage standard of 1.35 volts except this DDR4-4000 kit, which will require 1.35-1.40 volts. It would seem that the ICs used here are hand picked and tested, and thus each kit might have slightly different voltage requirements and thus uniquely programmed. The other design is the Ripjaws V, which will cover most frequencies from DDR4-2133 but also in the higher capacity configurations. I am told that G.Skill is ready to deploy a number of kits with 16GB modules, affording 2x16 and 4x16 kits giving 32GB and 64GB of DRAM respectively. 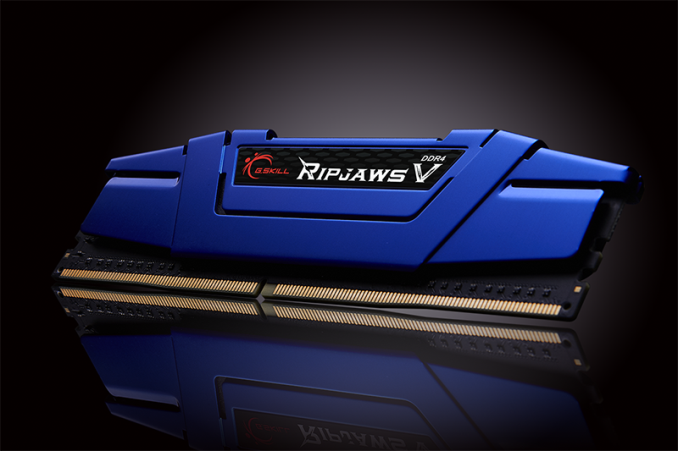 Ripjaws V will be available in red, blue, silver, gray and black. 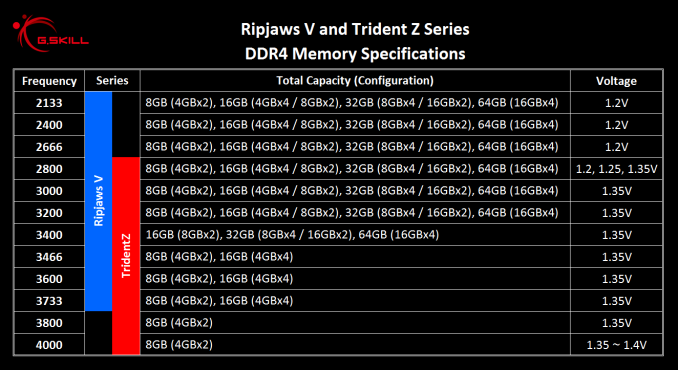 The 16GB modules are specifically using Samsung ICs, and will be available up to DDR4-3200. The Trident Z line is a lot less spiky than the previous Trident modules for good reason - personally I obtained injuries using it over the years because it was simply sharp. The new line avoids this, but also enables G.Skill to add its name to the top of the module, allowing modders to indicate exactly what modules are being used. Given this press release today, and what we’ve heard on the grapevine, it seems that Skylake is promising to be a super platform for DRAM in terms of both capacity and speed. Needless to say, pricing and specific release dates were not provided. I suspect other companies will follow with their dual channel kit announcements soon given this release today. DDR4 is here now and price isn't bad considering you have to buy RAM regardless. Why not use the faster stuff now and switch to HBM when it makes sense? At this point in time integrating their APU designs with an interposer and HBM probably won't be cheap. 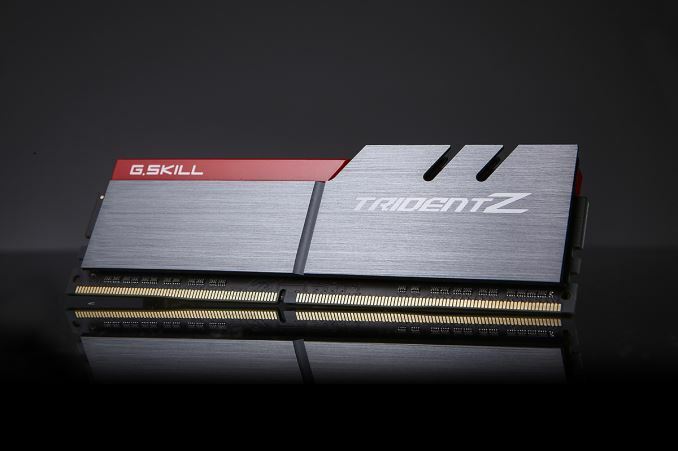 You can slap it in a high-end graphics card today, but how about a sub-$200 APU?